Publish announcements from any line of business on any topic. Share company performance reports and dashboards. Deploy cards that deliver end-to-end business workflows. Cards built for Appspace by skilled partner developers. Appspace Cards power all of your modern workplace initiatives. From digital signage, to room scheduling and kiosks, cards allow you to display any type of information you need. HTML5 card templates make it easy to create any type of card with no training required! Author once and view on all of your devices. Need more flexibility? Build cards using familiar development tools and manage with stylized themes and custom functionality. Lock in fonts, logos, colors and more with flexible theme controls. 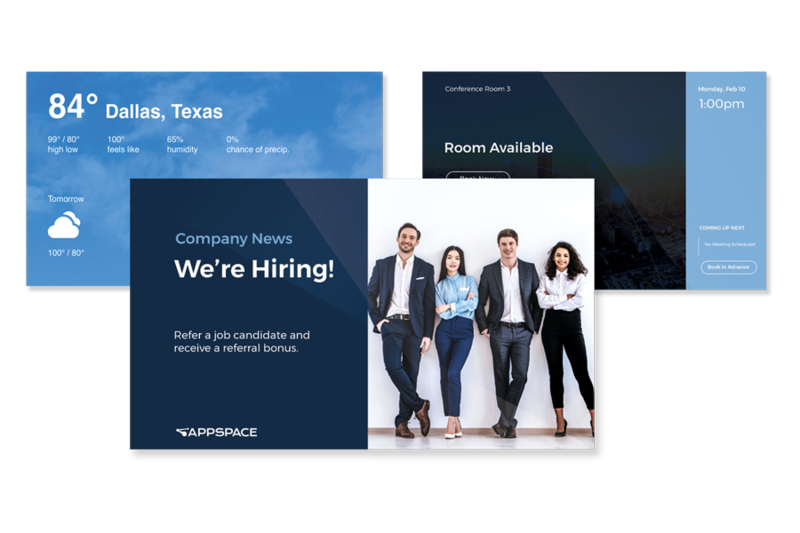 Cards use standard web technologies, so new templates and brand controls can be quickly added by your in-house team, or by members of the Appspace developer community. Our open API and HTML card framework provides easy integration with G Suite, Microsoft 365, Atlassian, Salesforce, Facebook, and more.